Barry Lopez asked 45 poets and writers to define terms that describe America’s land and water forms  phrases like flatiron, bayou, monadnock, kiss tank, meander bar, and everglade. The result is a major enterprise comprising over 850 descriptions, 100 line drawings, and 70 quotations from works by Willa Cather, Truman Capote, John Updike, Cormac McCarthy, and others. 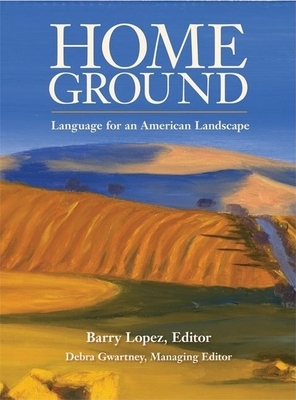 Carefully researched and exquisitely written by talents such as Barbara Kingsolver, Lan Samantha Chang, Robert Hass, Terry Tempest Williams, Jon Krakauer, Gretel Ehrlich, Luis Alberto Urrea, Antonya Nelson, Charles Frazier, Linda Hogan, and Bill McKibben, Home Ground is a striking composite portrait of the landscape. At the heart of this expansive work is a community of writers in service to their country, emphasizing a language that suggests the vastness and mystery that lie beyond our everyday words.